​Ilze Ikse is a flutist based in London with a special interest in contemporary music, and has worked with many young composers as well as with the renowned Clapton, Distractfold Ensemble and Plus Minus Ensemble. Ilze's recent performances have taken her to the Royal Festival Hall, the Barbican Hall, St. James’ Church, Piccadilly, Grimeborne, Tete a Tete Opera Festival and London Contemporary Music Festival as well as various venues in Berlin, France, Sweden and Spain. She is also part of Kammer Klang series at Cafe Oto, presenting curated programmes of new contemporary classical, experimental music. London based Irish clarinettist Jessie Grimes balances a busy schedule performing as a soloist, chamber musician and orchestral player, as well as a teacher and animateur. She has performed as a soloist at the Purcell Room, St John’s Smith Square, St Martin-in-the-Fields, the NCH Dublin and at the Brighton Festival. Jessie is a founding member of the Jacquin Trio, with whom she has won many awards and competitions including the Royal Overseas League Competition and St Martin-in-the-Fields Chamber Music Competition, the Salzburg Grand Prize Virtuoso International Competition, and the 19th International Chamber Music Competition, Thessaloniki. As an orchestral musician, Jessie been principal clarinet of the Wexford Festival Opera Orchestra for the past three seasons and regularly works with the BBC and RTE Orchestras and Camerata Ireland. As a student she enjoyed many tours with the European Union Youth Orchestra as principal bass clarinettist. 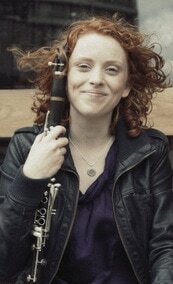 Jessie teaches clarinet at the Royal College of Music (RCM) JD and is an outreach mentor for their degree students. As an animateur she has presented live on BBC television, is a Live Music Now Artist and regularly leads workshops, residencies and pre-concert talks. Jessie graduated with an MMus from the RCM in 2011 and was awarded the Worshipful Company of Musicians Silver Medal for Outstanding Musical Achievement as well as RCM Rising Star and RCM Senior Woodwind Prizes. When not working, she loves hiking, rock climbing, yoga and stand-up comedy. Alice Barron is a violinist following a career combining contemporary and world music through performing and research. As a founding member of the experimental world music group, iyatraQuartet who recently performed at Songlines Encounters Festival, Alice is passionate about collaborating and creating new music with artists from all musical traditions. Alice recently launched Duo Folclore with violinist Fuensanta Zambrana Ruiz, which explores folk-inspired violin duos as well as new arrangements of Spanish and British folk songs. As part of a practice-led PhD at the University of Oxford, Alice is currently working on a series of collaborations creating new cross-cultural works for the violin that draw on her experiences studying in South India. Recent performing highlights include Nigel Kennedy's UK tour in January 2016, with the London Sinfonietta at the BBC Proms and in Poland, with folk singer Sam Lee, with whom she played with live on BBC Radio 3 from Hay Festival 2014, and at the Hayward Gallery and in Holland with bansuri player Shammi Pithia. Alice studied at the University of Nottingham and with Richard Deakin at the Royal Academy of Music, London, where she was awarded a distinction for her Masters in performance and research. Cellist Alice Murray is forging a career as a versatile and dynamic musician. Her work in chamber ensembles has led to performances at St Martin in the Fields and the City Lights Festival. As a soloist she has performed Saint-Saens’ La Muse et la Poète, Elgar Cello Concerto and the Brahms Double Concerto. An active freelance orchestral player, Alice regularly works with the Royal Opera House Orchestra, Covent Garden and the BBC Symphony Orchestra. Alice is committed to educational work and last year set up a festival, which brings together both young musicians and professionals in a workshop and performing environment. Alex Wilson studied at York University and for a Masters in piano performance with Andrew Ball at the Royal College of Music, from which he graduated with distinction. As a concert pianist he has performed around the country, in venues including Wigmore Hall and Cadogan Hall, and has performed in France, Spain and at the Rachmaninov Hall, Moscow. A specialist in contemporary piano repertoire, Alex is a previous prizewinner at the British Contemporary Piano Competition, performs regularly with the London Sinfonietta and has featured on both BBC 3's 'Late Junction' and BBC Radio 6 Music as a champion of contemporary music. His recent concert series ‘The Banks of Green Willow’: an exploration of the lost composers of the First World War attracted large audiences and received critical praise. As well as managing and performing with Dr K., Alex is part of the piano duo MANTRAS and he curates the successful Composer Academy at the Cheltenham Music Festival. Alex is based in Exeter, and exciting future projects will see Alex bringing more classical music to his home region, with plans for an Exeter-based music festival and a performance project with the Pound Arts Centre in Wiltshire creating links between professional music establishments across the region. After two years of training at the prestigious Purcell School of Music, Joe was awarded a scholarship at the Royal College of Music. Having graduated with First Class Honours, he continued his studies for a Masters in Performance, receiving a Distinction as an Ian Evans Lombe and Mary Dobson Scholar. Joe has performed all over the UK and abroad in a huge array of musical contexts; ranging from work as a contemporary solo artist, to that of an orchestral and chamber musician. He has appeared with ensembles including the BBC Symphony Orchestra, London Sinfonietta and the Lion King UK Tour Band, as well as several appearances on national television and radio. These projects have seen him working with such internationally renowned musicians as Diego Masson, Vladimir Jurowski, Bernard Haitink, Sir Roger Norrington, Deep Purple, Stewart Copeland (The Police), Mark Ford, Daniella Ganeva and Nebojsa Zivkovic amongst many others.